I just can't resist a bath bomb, especially when they're as pretty as BOMB Cosmetics Bath Blasters! - Summer is supposedly here, but the recent darker days have started to give me serious autumn vibes, which means saying goodbye to refreshing showers and hello to a long and luxurious soak in the bath. For just under £3 these Bath Blasters are super cute and add will add a touch of sparkle to any pamper session! With my holiday to Dubai coming up soon, I thought I would pick up Mermaids' Delight to get me even more excited than I already am for my travels! It smells pretty much like a tropical paradise and definitely gives me holiday vibes, especially as I'm looking to plan a few more vacations in. It contains ylang ylang and sandalwood along with natural butters, which make it a perfect pre-holiday treat. As I type this I'm actually sat in my "Snooziecorn" PJ's, so it's safe to say I do believe in Unicorns! - I've had this bath blaster before and this pink beauty is the ultimate girly girl bath blaster. It smells so lovely and sweet, but not sickly! Geranium and Frankincense essential oils also help to restore your inner princess! Last but not least when I saw this bath blaster it totally reminded me of The Wizard of Oz and it also smelt beautiful...so it had to go in the basket. Jasmine and Clary Sage essential oils take you on a euphoric experience as the blue swirl of natural butters condition your skin - damn, I can't wait to try this one. Have you tried BOMB Cosmetics before, if so what would you recommend? The designs of these are so cute! 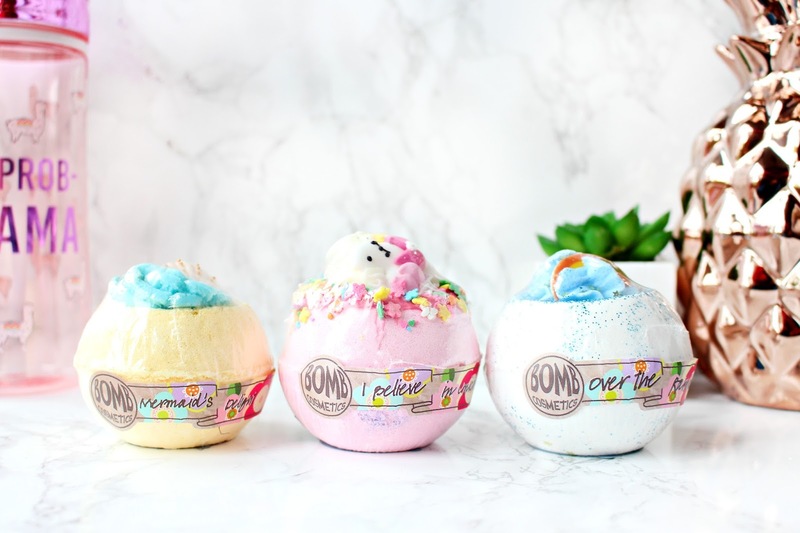 I am obsessed with Bath bombs so why I have I never come across this brand before? I need to get some of these in my life.